In October 2017, the Aston Martin DB11 Volante was introduced to the world. Not even a month later, it was introduced to Beverly Hills. 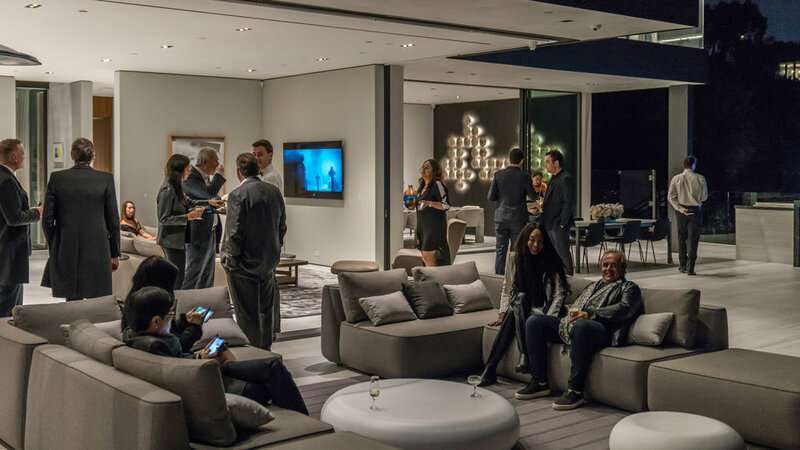 Aston Martin Beverly Hills was the first dealership given the opportunity to showcase the vehicle, and Letizia Silvestri wanted to make the night a memorable one. The iconic brand truly stormed to the world when James Bond got behind the wheel of the DB5 in the 1964 film, Goldfinger. It was this rich theatrical history that inspired the events of the night. Thanks to partners at The Agency, guests were welcomed through an entrance of the elements. From walls of black marble dripping in foliage met by pools of still water and flames rising from the center, a home couldn’t have channeled the elegance of Aston Martin Lagonda more. Sitting the right of the entrance was a 1964 DB5 and awaiting the guests just through the glass of the home was the sun setting over Los Angeles. Throughout the night guests were entertained by violin duo Alira Strings, and had the opportunity to view the existing model range offered by Aston Martin. But what the guests didn’t know was that there had been a couple amongst the crowd that was waiting for the clock to strike 7:13pm. This time represents the year in which Aston Martin Lagonda was founded, 1913, and in military time, the same. This time was when the night was filled with sound, the sound of an explosion that ushered the guests to the back of the property, along with the mystery couple. Upon the arrival of the entire crowd, the couple then danced with the wind around the covered vehicle, with the sole mission of unveiling the vehicle. The crowd applauded the performers, from Zen Arts, and the car was then presented by a member of Aston Martin Americas. From start to finish the night was intended to tell a story. From the moment the guests checked in, there was an allure to the back of the property. Just past the previously mentioned DB5 on display, you could see a hint of newest version of the DB line. The first drink offered was branded with the Aston Martin Beverly Hills logo, as well as every tray that passed by decorated with hors d’oeuvre. 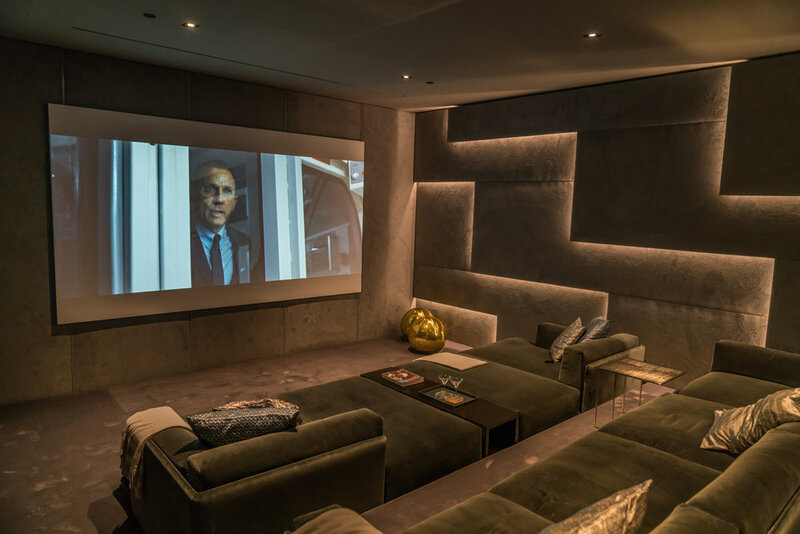 If one stumbled upon the home theater located beneath the property, James Bond Spectre would have been found playing on the screen, and the garage was filled with the most desirable of Aston Martin vehicles. This one-of-a-kind event conspired by Letizia Silvestri’s was brought to life with partnership and understanding of her vendors. Paul Lester of The Agency had negotiated to use of the property for sale, while Tik Tock Cutoure florals adorned the home. Zen Arts choreographed the banter and James Bond-like performance that brought the vehicle to life, while Red Carpet Systems built the bars utilized by mixologist team, the Grand Bevy. 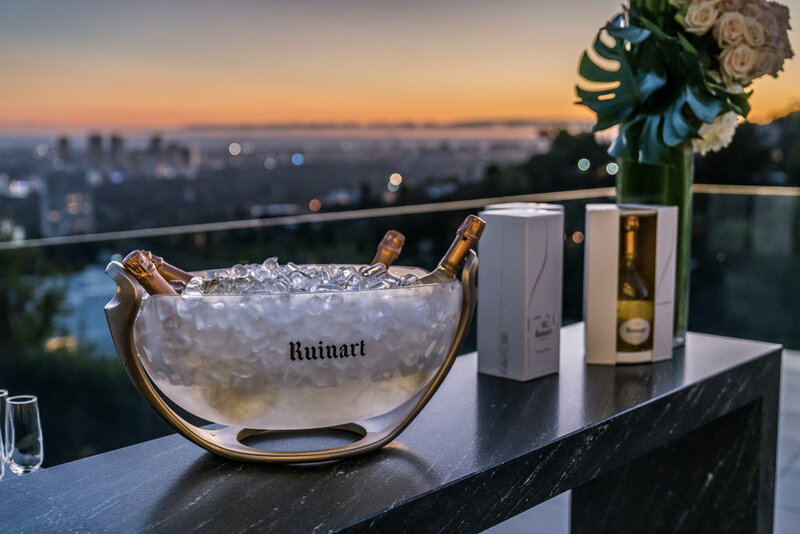 The models of Runway Waiters greeting guests were sure to place a glass of Ruinart Champagne in the hand of each guest to toast to the new product while the male models showcased and offered guests small bites from Angelini Catering on Aston Martin branded trays. It’s because of Silvestri’s relationships like these, that the event becomes unique and un-replicable. Photo source: Aston Martin Beverly Hills Website.